Transplanting a real-time strategy computer game into a satisfying portable devices release is rarely an easy task, even making a few significant changes and innovations would be better off amongst multitudinous chaos imitators. For one, it succeeds in adapting the battle controls and mechanics constrictions for iOS portables; Space Settlers manages to stand on its own. With assured storytelling, vivid RTS combat, MMO battlefield mode, and imaginative design, Space Settlers brings an enjoyable experience to iOS iPhone iPad. Space Settlers isn’t the first multiplay game for iPhone iPad, but it’s the first that has made great strides at mixing genres of Sci-fi plot and real-time tactic like Imperium Galactica. If you are a Sci-fi novel readers or sci-fi complex psychology, the background of Space Settlers reads almost exactly like the prologues to these science fiction movies. The story begins with the God Particle since its first appearance in 2012. Scientist Hawking has been scripted to appear in this story by linking his brain with the most powerful computer in the world. His predication of dark energy crystal which has become the most energetic prototype forces human beings to explore this powerful infancy and transfer to outer space to look for. There is something to be said about the fact that Space Settlers is easy to pick up and understand, the simplicity comes from the novice task guided by “Do this” school tutorial. You do two things in Space Settlers : base building and combat. This iPhone iPad game does a fantastic job of getting exploration started, collecting resource, upgrading tech-buildings, building defense towers, refitting chariots, and joining in multi-player battlefield or legion wars via instant online chat with your friends or alliances. Granted, Space Settlers is quite good in tight, enthralling and deep combat with vibrant interpretation art, and the background music do a great job likewise. 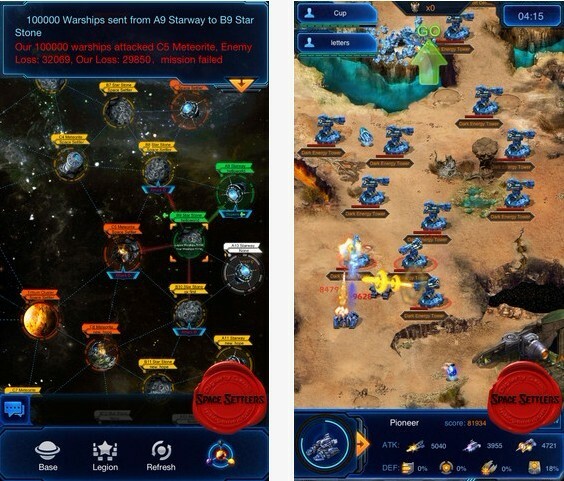 This multi-player online game working on iPhone iPod is a pleasure to look at and interact with, brimming with sci-fi style and deploying battle strategy. And yet is also comes a video trial in YouTube channel for visual feast: http://www.youtube.com/watch?v=M0I2NavC4gY.